Second entry in the "Small Art Big Heart" show at Hampton House Gallery. Every year Hampton House Gallery has a benefit show for Aids Care Service here in Winston-Salem: "Small Art Big Heart". A portion of the proceeds from every painting or craft sold goes to this charity. Here is the first entry that I painted just for this event. Runymede Road is a very popular Spring drive where one can see many massed plantings of azaleas, dogwood trees, cherry trees, flowering crabapples, jonquils-an abundance of color and fragrance! Many people say that this is the most beautiful street in our city. With all the "Joy of Creating" ,here is my completed painting! 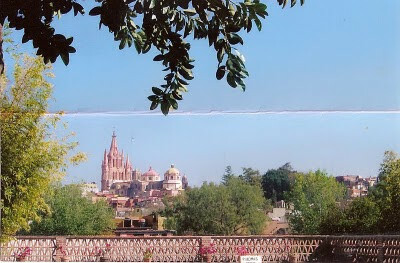 The more I painted the more I walked the streets of the San Miguel of my mind and felt the pull to return. The warmth of the people, the color of the architecture and decorations, the soulful music, the delicious food and the pleasant climate all make this a very magical and inviting place to be. In this stage the entire painting surface has been covered with the dark and light areas being established along with local color. In the next phase of painting, I will sharpen and add detail to the cathedral and surrounding area and define the vegetation a bit more and probably add more light/dark contrast in some areas. 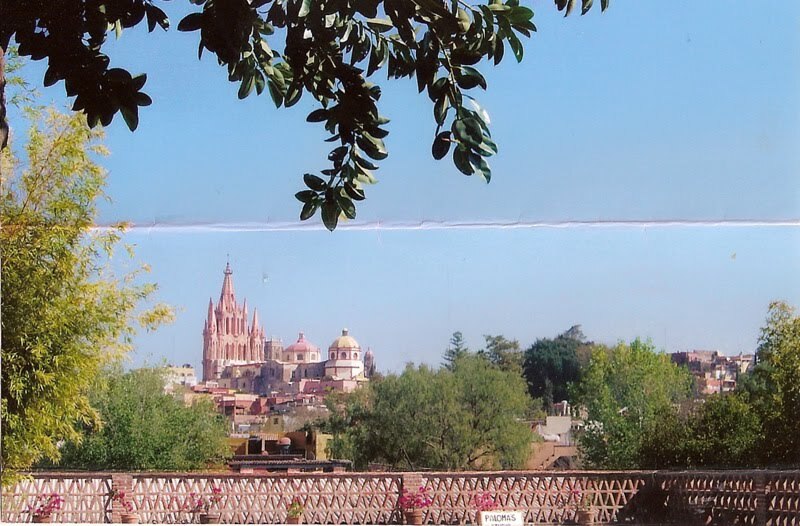 This photo is San Miquel as seen from the patio at the Instituto. The beautiful cathedral on the left is the "Parroquia San Miguel Arcangel"-a structure of interesting varieties of architecture. Pictured also is my drawing that I have done on a gessoed cradled wood panel . This is a work in progress, so there will be other posts as the painting process unfolds.